Samsung Notebook 9 Pro with S-Pen: How good is it really? 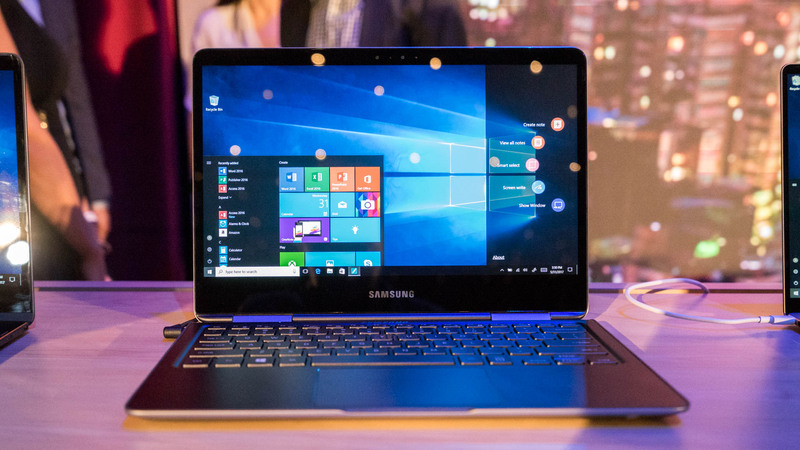 The Samsung Notebook 9 Pro is a new convertible notebook with a S-Pen and Windows 10. You can turn the touchscreen around 360 degrees to turn it into a tablet. I had the chance to check it out just a bit at an Event from Microsoft during Computex 2017 in Taipei. Here are my first impressions. The Samsung Notebook 9 Pro is another Convertible Notebook with a touchscreen that can be rotated around 360 degrees. That way you can convert the notebook into a tablet. We’ve seen this concept for years now from Lenovo and other competitors – now Samsung has this concept too. I quite like the design so far. It’s body is mostly made out of aluminium and it feels nice in your hands. There’s a webcam above the display that also supports Windows Hello. On the sides are a couple of ports including a USB Typ C Port, two USB 3.0 Ports and a HDMI out as well as a microSD card slot. There’s another slot on the Notebook 9 Pro and this one is meant for the S-Pen. There are a lot of competitors with an active stylus out there though but Samsung is one of a few manufactures who actually offer you a convenient way to store the pen inside the body. Even the last tablets from Samsung don’t offer that. That comes with a price though. Because the S-Pen has to fit inside the body it is pretty slim – way slimmer than the pens from most competitors. So it might not be as comfortable to hold for a long period of time. What’s nice though is that you don’t need a battery with the pen and you don’t need to charge it – it just works. Even though there’s Windows 10 running on the notebook the S-Pen works very similar to the one under Android. Samsung even ported the Air Commands over that we’ve seen from the Galaxy Note Series for years now. Obviously it supports all the Windows Ink features as well – you can do some handwriting, draw something and so on. By the way, the S-Pen supports over 4000 pressure points just like the new Surface Pen. Let’s take a closer look at the hardware. Samsung is actually offering two versions of the Notebook 9 Pro – one has a 13.3 inch touchscreen and the other one a 15 inch one. Both have a full hd resolution at 1920 x 1080 which actually is quite low – especially for the 15 inch display. Besides that the display seemed fine though and looked very nice. There’s an Intel Core i7 U-Series processor inside that belongs to the latest Kaby Lake generation. You can get it with 8GB or 16GB of RAM – depending on the version – as well as a 256GB SSD. I’m sure Samsung will offer other SSD sizes as well. With the 13.3 inch Notebook 9 Pro you’re getting an Intel HD 620 graphics chip and the 15 inch one comes with an AMD Radeon 540. Sadly I couldn’t play too much with the Samsung Notebook 9 Pro – they just didn’t allow us to much time with it. But my first impressions are pretty good, it seems to be a solid convertible. But there are a lot of convertibles like this out there and Samsung really has to watch its pricing. The competition is pretty strong with companies like Lenovo, ASUS, HP and others being in this market for a long time now. Read Now: ASUS ZenBook Flip S is the worlds thinnest convertible?